Glow in the Dark Tapes | J.V. 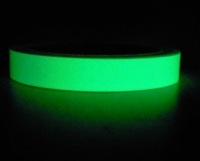 Converting Company, Inc.
JVCC Standard GLW Glow in the Dark Tape is a flexible polyester laminated photoluminescent film tape with a permanent adhesive on one side. The photoluminescent pigments absorb and store energy from normal, ambient light. In sudden darkness the tape is immediately visible. The tape provides a non-electric safety marking system that easily and inexpensively affixes to walls, handrails, columns, around door frames, and along stairways and baseboards (provides visibility during an emergency). It is wound on a liner for easy handling. Also used for identification of critical equipment controls, exit and directional signage (especially for escape routes and stairways), light switch covers, labels, decals, novelties, sporting goods, trims and special effects. Used in hotels, hospitals, schools, public facilities, office buildings and manufacturing plants. JVCC GLW-24 Professional Glow in the Dark Tape is a flexible polyester laminated photoluminescent film tape with a permanent adhesive on one side. The photoluminescent pigments absorb and store energy from normal, ambient light. In sudden darkness the tape is immediately visible. The tape provides a non-electric safety marking system that easily and inexpensively affixes to walls, handrails, columns, around door frames, and along stairways and baseboards (provides visibility during an emergency). It is wound on a liner for easy handling. Also used for identification of critical equipment controls, exit and directional signage (especially for escape routes and stairways), light switch covers, labels, decals, novelties, sporting goods, trims and special effects. Used in hotels, hospitals, schools, public facilities, office buildings and manufacturing plants. Pro Tapes Pro-Glow Glow in the Dark Tape is a phosphorescent vinyl film tape which glows in total darkness after exposure to artificial or natural light. The photoluminescent light source is designed to absorb energy from any nearby ambient light such as fluorescent lamps or sunlight. Once the source of extraneous light is removed Pro-Glow emits a light source of its own which is visible to the night-adjusted eye. When fully charged Pro-Glow provides luminance for up to 10 hours. There isn’t a limit to the number of times this product can be recharged (also remains highly effective for use for up to 6 years). It will glows brightest for the first 15 to 30 minutes after charging has ceased, but will remain visible in a totally dark room to the night-adjusted eye; however it would not compare it brightness to say a standard flashlight. In its uncharged state the tape has a whitish/yellow color and when glowing the tape has a luminescent lime green color. Recommended for interior applications only. Pro Glow is used to spike stages for the placement of scenery and to mark exits, light switches and panels in dark areas. 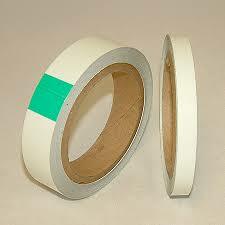 The tape’s flexible backing is conformable and easy to cut. 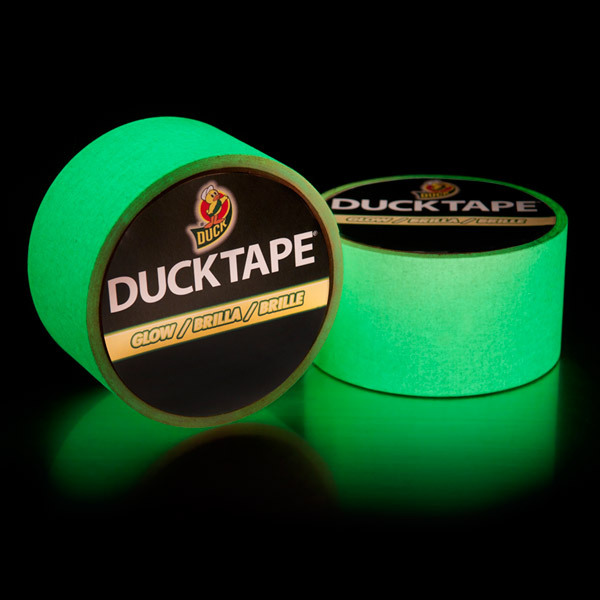 Duck Brand Glow-In-The-DarkGaffers Duck Tape is a premium gaffer tape product that glows in the dark. It offers clean removability and it’s cloth substrate is hand tearable in both directions for ease of use and readily conforms to complex surfaces unlike traditional film glow-in-the-dark tapes. Gives the added benefit of being photoluminescent after the tape is activated by an artificial or natural light source. Applications for stage safety are numerous; such as marking stair and exits. Duck Glow in the Dark Tape is printable and can be die cut to different shapes and sizes. In its uncharged state the tape has a natural color and when glowing the tape has a luminescent lime green color. The tape is typically fully charged within 30 minutes after exposure to either artificial or natural light and glows brightest the first 15 to 30 minutes after activation has ceased, but will remain clearly visible in a totally dark room to the night-adjusted eye for hours (to the night-adjusted eye it is visible, but it would not compare it brightness to say a standard flashlight). It is also writable / printable and its non-smearing surface provides quick temporary labels and signs that are readable in the dark. 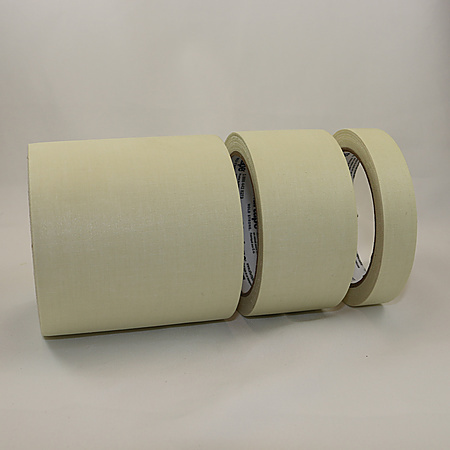 Please note the narrower 3/4″ inch wide rolls are very small which is great for craft projects . They come on a 1 inch diameter core instead of the standard 3 inch diameter core; also the outside diameter (measuring across the roll) is closer to 1-3/4 inches while the standard 2 inch x 10 foot glow roll would measure about 4 inches across. Shurtape P-661 Glow in the Dark Gaffers Tape is a premium gaffer tape product that glows in the dark. It boasts the same high quality adhesive as Shurtape P-665 and offers the same clean removability and it’s cloth substrate is hand tearable in both directions for ease of use and readily conforms to complex 3D surfaces unlike traditional film glow-in-the-dark tapes. Gives the added benefit of being photoluminescent after the tape is activated by an artificial or natural light source. Applications for stage safety are numerous; such as marking stair and exits. 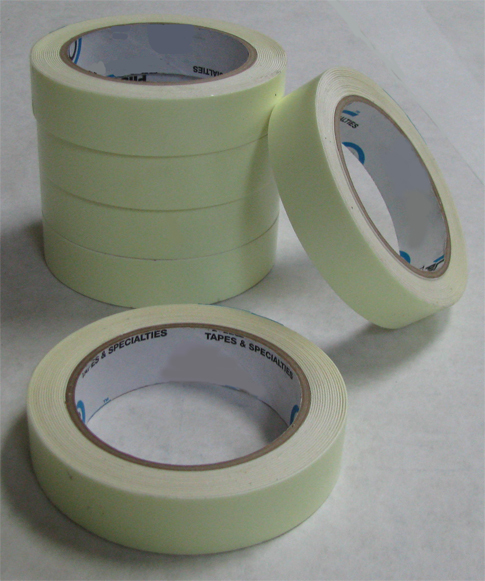 Shurtape P661 is also printable and can be die cut to different shapes and sizes. In its uncharged state the tape has a natural color and when glowing the tape has a luminescent lime green color. The tape is typically fully charged within 30 minutes after exposure to either artificial or natural light and glows brightest the first 15 to 30 minutes after activation has ceased, but will remain clearly visible in a totally dark room to the night-adjusted eye for hours (to the night-adjusted eye it is visible, but it would not compare it brightness to say a standard flashlight). P-661 meets ASTM E 2072 qualifying its use for safety markings in windowless areas. It is also writable / printable and its non-smearing surface provides quick temporary labels and signs that are readable in the dark.